The death of 39-year-old, Leon Briggs, who recently lost his life just hours after he was taken to Luton Police Station and detained under the Mental Health Act is causing widespread alarm at the way Black Britons in need of mental health care continue to be treated. On Monday 4 November 2013, Bedfordshire Police officers attended the junction of Marsh Road and Willow Way after responding to reports from members of the public who had reported their concerns relating to the late Mr Briggs’ behaviour in Marsh Road, Luton, earlier in the afternoon. Mr Briggs was then restrained by officers, detained under Section 136 of the Mental Health Act and taken to Luton Police Station but was later pronounced dead in hospital the same day. A statement released by Chief Constable for Bedfordshire Colette Paul said five of their officials involved in the incident have been suspended pending the outcome of an ongoing investigation by the Independent Police Complaints Commission (IPCC). She said: “Their suspension in no way jumps to any conclusion about the outcome of the investigation but ensures absolute assurance of neutrality and transparency as the IPCC investigation progresses. The suspension of each member of staff will remain under constant review. We continue to co-operate with the investigation to help provide Mr Briggs’ family, the coroner and the IPCC with accurate information about how and why Mr Briggs died. This news comes just weeks after human rights campaigns group Black Mental Health UK launched a national campaign against black deaths in custody in a move to bring about the much needed change in the way in which vulnerable people from the community are subject to often lethal levels of force by both the police and mental health services when in need of mental health care. Studies show that detention rates for Black Britons have doubled over the past five years and people from the UK's African Caribbean community are 50% more likely to be referred to mental health services via the police than their white counterparts. Almost half the deaths of people in police custody are mental health service users. Most worryingly, deaths of those detained under the Mental Health Act account for 60% of all deaths in state custody and a disproportionate number of deaths following contact with the police since 2004 are of black people. Matilda MacAttram director of Black Mental Health UK says this tragic case confirms the worst fears of too many people from the UK’s African Caribbean communities who continue to be over represented amongst those detained under the Mental Health Act, who also end up in police custody and sadly among those who lose their lives in these settings. The Independent Police Complaints Commission (IPCC) says that potential criminal offences may have been committed with regard to the death of Mr Briggs. It points out that these offences could include negligence or manslaughter and potential disciplinary offences. "However, at this stage we believe there is an indication that potential criminal offences may have been committed including gross negligence and/or unlawful act manslaughter, misconduct in public office, and/or offences under the Health and Safety at Work Act 1974.We will also be considering whether any potential disciplinary offences have been committed." Mr Briggs' family issued a statement saying: "Leon was a loving father, son and brother. He was a kind, loyal, intelligent, caring person who put his family and others first. 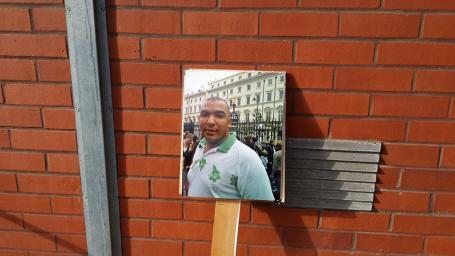 "It is important to us to see the seriousness with which the IPCC are approaching the investigation into Leon's death."